Pate a Choux Recipe - Let the Baking Begin! Pate a Choux is a hollow and light as air pastry that is often filled with different fillings. The outside of the pate choux is crisp, while the inside is nice, soft and custardy. The pastries can be sweet in the form of eclair, a St. Honore cake, a cruller donut or savory in the form of a gougere. Pate a Choux or Pate choux is the dough that makes Profiteroles or Cream Puffs, Eclairs, St. Honore cake, French crullers, churros, and even savory gougeres. Different shape and method of cooking will render a different dessert, but the dough and it’s preparation technique is all the same. What is Pate Choux made with? The pate choux dough is made with milk, butter, flour, and eggs. 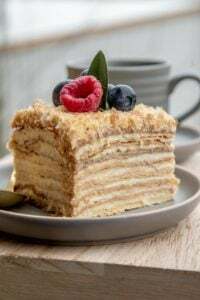 The high moisture content of the dough is what creates the hollow inside of each pastry which is very convenient for filling it with custards and cremes. Properly made choux pastry will be light and airy, with crisp exterior and a soft almost custard-like interior. The inside will have large air pockets, which makes it easy to fill. The baked profiteroles or eclairs should retain their shape even after being cooled, instead of collapsing. Make sure the dough is smooth when you’re done incorporating the eggs and ready to pipe. Undissolved flour or eggs will cause the pastries to bake “lumpy” or with irregular cracks. Use a French star pastry tip for piping the eclairs. 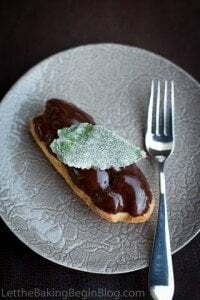 This particular tip has fine “teeth” which once the eclair bakes help the zigzags on the surface even out into a more round and perfect eclair. You can use a regular star tip or even round, but the best results will be with the French star tip. Make sure to bake the pate choux enough. Removing the dough from the oven too early will cause the pastries to be soggy and collapse once out of the oven. Do not overbake the pate choux. Overbaking will cause them to be too dry. Do not open the door while the puffs or eclairs are baking. This will cause them to collapse. Do not rely on the instructions/recipe alone. Every oven is slightly different. Keep an eye on the pastries as they bake. If the recipe gives you an approximate baking time, but you see your oven is already burning the pastries before the time is reached, use your judgment and remove them from the oven. This is the basic recipe that can be further used for different fillings and desserts. Later this week I will share a recipe for the Maple Glazed Coffee Eclairs that you all saw on Instagram. Stay tuned! 1.Preheat oven to 425F. Line a baking sheet with parchment paper or foil. Set aside. 2. Whisk eggs together and set aside. 3. In a saucepan combine milk, water, sugar, salt & butter. Bring to a boil over high heat. 4. Add the flour all at once. Quickly stir with a spoon to bring the mixture into a dough. Bring the heat to low and continue stirring for another 2-3 minutes to evaporate some of the moisture. 5. Transfer the dough to a mixer bowl and mix on low with a paddle attachment for 2-3 minutes to cool the dough slightly. Add the egg in 4-5 additions, mixing until smooth before each addition. 1. Fit a pastry bag with a large French star tip. 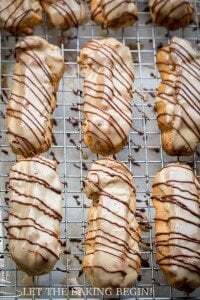 Star tip is not essential, but it does help the eclairs puff up and not crack, as the space between the ridges flattens out into a nice round eclair. 2. Fill the bag with the pate a choux dough. Pipe 3 to 4-inch logs about 2 inches apart on the prepared baking sheet. 3. Refrigerate or freeze the second sheet of piped eclairs while the first one is baking. 4. Bake for 15 minutes at 425F, then reduce heat to 375 and bake for another 10-15 minutes until the éclairs are a deep golden color. Do not open the oven until the éclairs are golden in color or they will deflate. As soon as they’re out of the oven, use a skewer to poke 2 holes at each end in each éclair to let the steam escape. Transfer to a cooling rack and cool. Reheat the oven to 425F before placing the other sheet straight from the freezer to the oven and baked as described above. White Chocolate Raspberry Macarons – Delicious macaron recipe made with raspberries. Apple Rhubarb Meringue Pie – Pie with apple rhubarb. 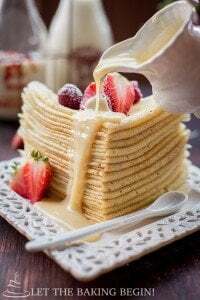 Simple Yellow Sponge Cake – A classic sponge cake recipe. Pate a Choux is a hollow pastry that is often filled with different fillings. The pastries can be sweet in the form of eclair, a St. Honore cake, a cruller donut or savory in the form of a gougere. Turn the oven to 425F. Line a baking sheet with parchment paper or foil. Set aside. In a saucepan combine milk, water, sugar, salt & butter. Bring to a boil over high heat. Add the flour all at once. Quickly stir with a spoon to bring the mixture into a dough. Bring the heat to low and continue stirring for another 2-3 minutes to evaporate some of the moisture. Transfer the dough to a mixer bowl and mix on low with a paddle attachment for 2-3 minutes to cool the dough slightly. Add the egg in 4-5 additions, mixing until smooth before each addition. Fit a pastry bag with a star tip and drape it over a mug. Fill the bag with the pate choux dough and twist the end. Pipe 3-4 inch long batons about 2 inches apart on the prepared baking sheet. Place the second sheet of piped pate choux into fridge or freezer until the first sheet is done baking. Bake for 15 minutes, then reduce heat to 375 and bake for another 10-15 minutes until the éclairs are deep golden color. Do not open the oven until the éclairs are golden in color or they will deflate. As soon as they’re out of the oven, use a skewer to poke 2 holes at each end in each éclair to let the steam escape. Transfer to a cooling rack and cool. Can these be frozen after made? I’ve purchased from our local bakery and sometimes they seem like they’ve been frozen. I’m baking a variety of pastry for an event and freezing would save me time. Thanks for sharing your recipe and tips. I’m anxious to make them! Yes, these can be frozen. Good luck in your baking! Classic Eclair - Let the Baking Begin! Wanted to give you my token of appreciation for posting this recipe. I finally got around to making good it. I made everything according to the recipe directions, however piped them out round.They baked evenly and came out perfect. Not a single one got deflated, which is the case sometimes with заварным тестом. The recipe really works! Did some savory eclairs with dill and turkey paste and some for dessert with chocolate mousse with peanut butter. Incredible. Thanks! Oh wow! dill and turkey paste? tell me more! that sounds like a great combination! I’m glad you liked this recipe! Maple Glazed Coffee Eclairs Let the Baking Begin! I am absolutely trying this! Question though, once first sheet is done backing, am I just throwing the frozen one right into the Owen from freezer? Cant wait to make this. Thank you for recipe. You’re welcome, thank you for reading my blog! Yum! 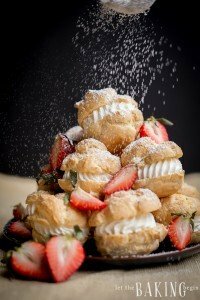 I admit I’ve never made choux pastry, but I might have to try this tried and tested recipe! Thank you for the tip. I had the same problem where these get really picky and won’t came out properly. May I ask what brand of butter you are using? Also, would you be so kind as to share what kind of flour works best. Hope your daughter is better. I use the Costco unsalted butter and Canadian all purpose flour. I only buy Canadian for my all-purpose flour needs. No better flour than that 🙂 And Costco has the best price for the quality so I only get theirs.